A low cost endoscope with high end features. Artemis Vision developed GPU based algorithms to remove mesh from images affected by fiberoptic distortion so that doctors can get crystal clear images with an immensely cheaper set up. We also took things further building a full-featured application for the doctor. Doctors can now take video, zoom in and out, play back prior videos, edit videos, and view anything in slow motion all in one application. The final product is an endoscope that performs nearly as well as its vastly more expensive competition, but at a realistic price point for developing world doctors. Endoscopes in the developed world often use “chip on the tip” technology. This means the camera goes at the end of the scope. Today, price points still hover around $30K for chip on the tip designs because building cameras small enough for the tip of the scope is vastly expensive. However, the consumer market in larger format digital cameras has sent those price points plummeting for larger scale cameras. The result has been an opportunity to build endoscopes using cameras that go outside the body and fiberscopes to achieve lower cost designs targeted at the developing world. 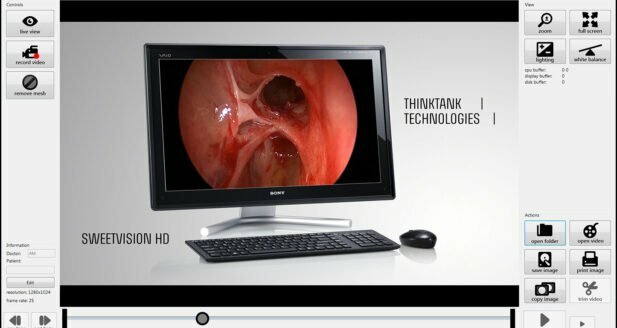 Think Tank Technologies and Artemis Vision decided to partner on a low cost endoscope that would take advantage of these low price point cameras and fill the market need for endoscopy in the developing world. With a relatively inexpensive HD digital camera and fiberscope, Think Tank Technologies built a prototype for the physical device. Putting the camera outside the body at the end of a fiberscope cut costs to around $3K but left a big problem. The fiberoptic distortion left a mesh pattern across the image rendering it difficult to read. The software necessary to remove this mesh, efficiently and in real time, would be difficult to develop, but Artemis Vision’s software delivered ideal results.